However, I have this photo of a Leisure 20 that clearly illustrates some of the features mentioned in the article. The first item of merit was her long waterline length which is not much less than her overall length. The benefit, of course, is maximizing on the length to give speed through the water. The longer a boat, the faster she can go. The second item was her wide beam, which is not evident from the photo, but her wide beam gives her a good measure of stability and a spacious interior. The writer claimed Leisure 20s could go anywhere, even offshore sailing, which I also believe is true. 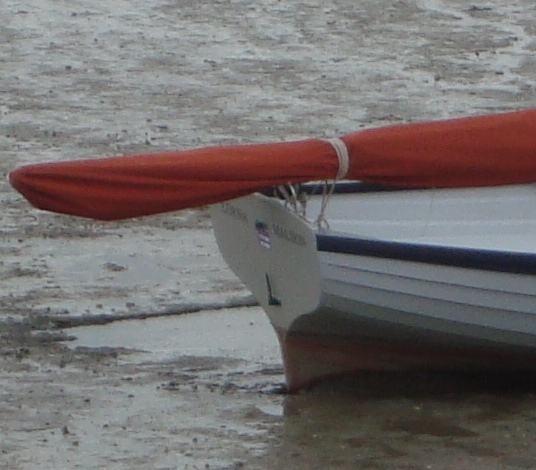 Her relatively shallow draught of little over a metre allows her to be sailed in estuaries, and her bilge keels protect her hull when she takes the ground. 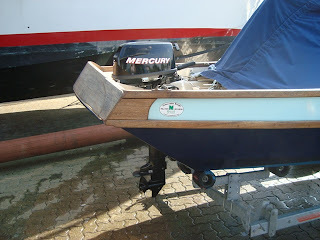 There is a centreboard version that has a galvanised metal plate. Both versions have provision for inboard/outboard engines that give good manoeuvrability, even when going astern. Surprisingly, the name of the German designer of the hull is not known, but the superstructure was designed by Brian Meerloo. I have sailed a Leisure 20 and I found that she felt like a much bigger boat. She handled faultlessly under sail and motor while experiencing a variety of conditions. I liked the cockpit which was large enough for two people to move around without getting in each other’s way. The advertising blurb reckons four can comfortably fit in the cockpit; that’s true, but that’s not the case when sailing, especially short-tacking. I’ve heard it said that the Leisure 20 does not perform well to windward, but with her high aspect mainsail and masthead Genoa, I would dispute that. 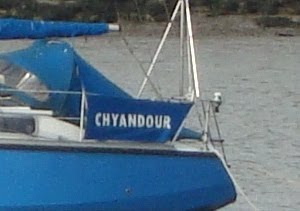 Here we have a photo of ‘Chyandour’, which I believe is a Bruce Roberts 345 - the original chine version that could be built from steel, fibreglass or wood epoxy. This one, almost certainly is a steel boat, and most likely she has a shoal draught keel. There is a fin keel version. Because of popularity and demand for the yacht, Bruce went on to develop the plans to include a radius-chine hull in steel or aluminium. He is an extremely successful boat designer who has drawn many plans for amateur builders and professionals alike. He very cleverly provides loads of options for prospective builders, as is the case with the 345. Not only can this cruising yacht be constructed from different materials, but her owner can choose which internal layout he would prefer. Above deck he can opt for a pilot house or go for the more conventional low profile cabin trunk. The 345 can be rigged as a sloop, a cutter or a ketch. Leslie Powles, who was the 1981 yachtsman of year, circumnavigated the world three times aboard ‘Solitaire’, his Bruce Roberts 345. 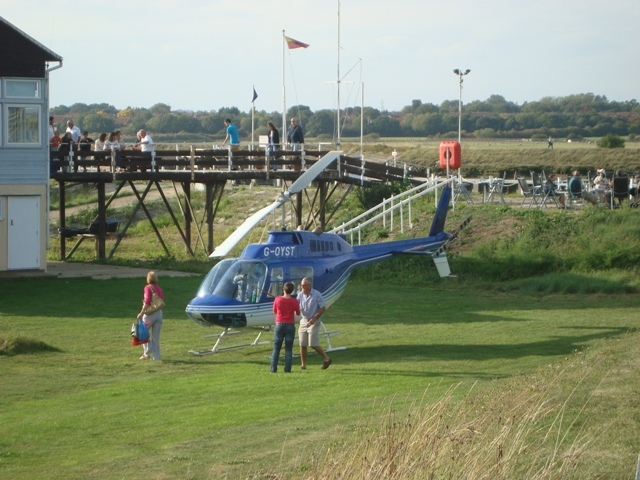 On Sunday afternoon, 25th September, 2011, I happened to be walking by the Brandy Hole Yacht Club when there were a number of people sat on the veranda overlooking the River Crouch. To my surprise a blue and white helicopter with the registration G-OYST alighted on a small lawn adjoining the yacht club. I was amazed that this could happen. To my uninitiated eye, there seemed little room for error. The double blade whirred within feet of the building and it was a matter of yards from almost disinterested spectators. This event seemed to cause hardly a stir from those who watched; there were only glances in the direction of the passengers and pilot as they alighted from the aircraft. Maybe airborne visits by them are regular occurrences. Well, it was certainly a novel way of dropping in! As I’ve mentioned before, the amount of information on the World Wide Web is staggering. By typing in the registration number of the aircraft, OYST, into the Google search box, details of this particular helicopter are available for all to see. The 1975 aircraft is owned by Adroit Services Corporation, at St. Peter Port, Guernsey and it has flown for over 5,700 hours. The helicopter’s certificate of airworthiness expires on 19th May of next year etc., etc. Instead of wasting my time and yours, I’ll finish here with a few links leading to other links relating to the owners of the helicopter who are in the business of financial services. Adroit Services Corporation, Havilland Management Ltd. Directorate Change - Richard Ian Causton employed by Havilland Management Ltd.
Here’s a photo taken by me last Saturday evening. By appearance, the sunset was nothing out of the ordinary; nevertheless it was beautiful. I felt an atmosphere of calm and peace as the sun gradually sank beyond the horizon. 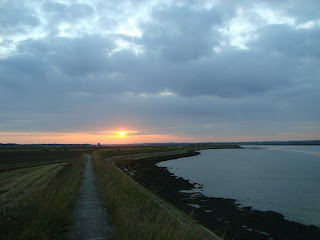 I was alone at my favourite place beside the River Crouch. All of this splendour was there solely for my enjoyment. For me, sunsets are always special. When I was a nipper, I used to take a walk to the brow of hill on a fine summer’s evening. From there I could watch the changing hues; blues to purples, golden crimson and streaks of orange; finally an oval, white-hot shimmering blob would slip beyond the dark rim of the encroaching night. One evening I did not understand what was happening. The sky was a fiery, scarlet glow of spattered blood. There was a droning, moaning from overhead. Hundreds of black Dakotas towing gliders, their wings outstretched like birds of prey, steadily moved in formation. When they had passed, there was an eerie silence. Brave men were on their way to give their lives for the cause of freedom and their kin; for helpless babes, children, men and women, for justice, truth and all mankind. This I now know. I shall never forget their sacrifice. I shall never pay the debt I owe. For them it was their death and the gift of life; a life that I treasure, a life so full and free. No other man could have lived like me, for by God’s grace He has set me free. Shortly after the retreat from Mons and the battle of Marne during the Great War, Robert Laurence Binyon wrote his poignant poem, ‘For the Fallen’. One verse sums up my gratitude to those who fell. These moving words are said on November 11th every year at ceremonies commemorating the brave and the selfless who fell during the First and Second World Wars, and in more recent times, at the Falklands, Iraq and Afghanistan. This Skipper 17 is definitely NOT a project; she would appear to be well-cared for, and the pride of her owner. Now and again you come across an advertisement telling of a boat ‘project’. Once you see the word ‘project’, you know there is work involved. 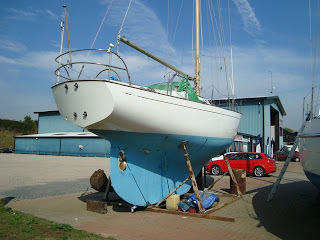 At Ebay you can sometimes find such a boat. If you have the time and the will, you can with some effort end up with a good boat without spending too much money. Certain fibreglass boats like the Skipper 17 seem to survive for ever. They are found and restored, maybe not to their former glory, but well enough for the restorer to enjoy her or sell at a profit. 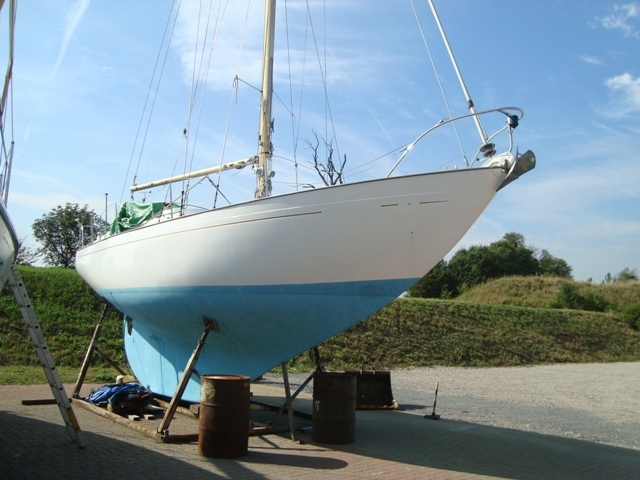 Fibreglass is virtually indestructible, which means that when a boat is left to rot, her hull remains; only items like bunk cushions, curtains and linings disintegrate. 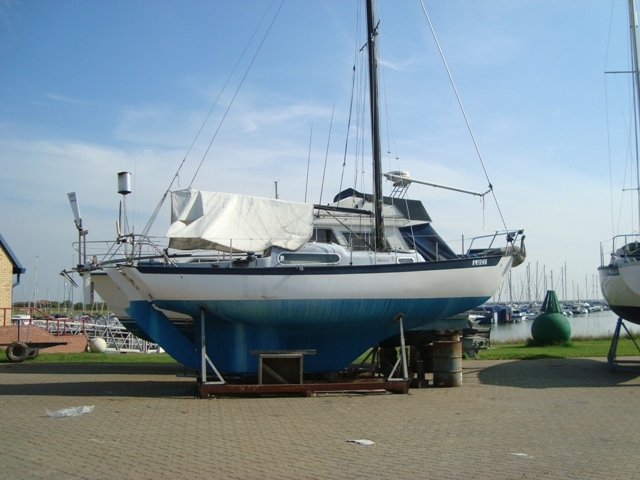 Yes, water that may accumulate in the bilges could eventually penetrate the fibreglass and weaken laminates, but much of the structure will remain. My old Hunter 19 Europa ended her life in this way; she was left derelict by her last owner at a Benfleet boatyard. Right now there’s a ‘project’ Listang* open to bidding at Ebay.Co. UK. She’s typical of a restoration project, but whoever would take on this particular project must really desire a ‘Listang’! I previously mentioned the Skipper 17, because she’s typical of early GRP boats that may end up in a broker’s yard without anyone caring for them. The one in the photo is most definitely looked after, because she’s the same vessel I photographed last year, occupying the same mooring, and looking every bit as if her owner cares. Incidentally, there’s a lot of information online about Skipper 17s, including my article** about them on September 29, 2010. I much prefer to use my own photos when posting here, but sometimes there are photos that are too good not to make available to the general public. 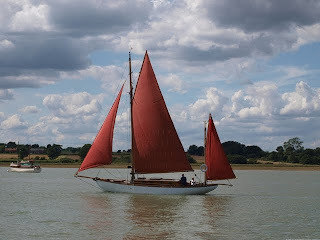 This photo is of a rather special Albert Strange yawl, ‘Nirvana of Arklow’. I copied* it from Your Boat Pix. (See link below) Photos at that site have been placed there for owners of yachts who may perchance discover them. Have a look at Boat Pix, because you may come across a photo of your yacht there. ‘Nirvana’ is a real stunner. Everything about her harmoniously gels together. It’s a case of function and aesthetics blending to form a near perfect creation. 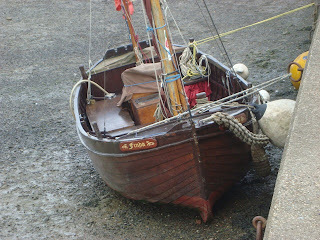 This splendid 31foot 9 ton yawl was built for Billy Mooney in 1925 by Jack Tyrrell of Arklow. She was originally named, ‘Nirvana’. Other photos of ‘Nirvana’ can be found at the Albert Strange Association’s website where they are freely available for all to see – it just needs a little probing to winkle them out. *As far as I can tell, there are no copyright restrictions at the Your Boat Pix website. It is said that owners of their dogs look like their dogs! I wonder if a parallel simile can be applied to owners of Seadog Ketches. If so, they will be solid, strong, and dependable, just like a St Bernard dog. 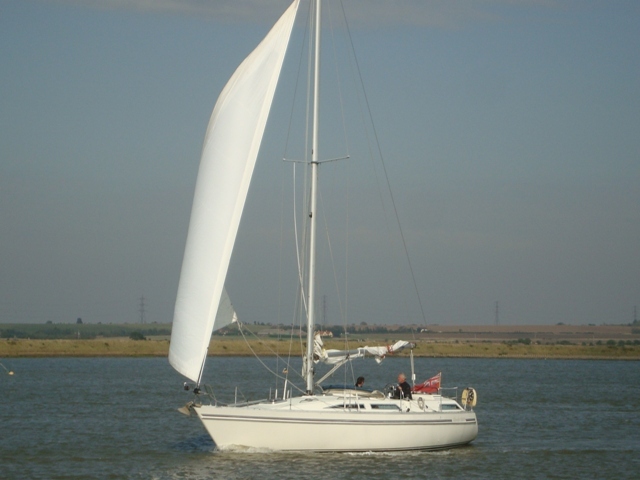 In truth, the GRP Seadog 30 has been around since 1964 when the first one was designed and built by Reg Freeman, A.R.I.N.A.. She was originally conceived as a comfortable motor sailer, but in practice she has a good turn of speed under sail. Two versions were produced: the bilge keel Seadog 30 and the single keel Deep Seadog. 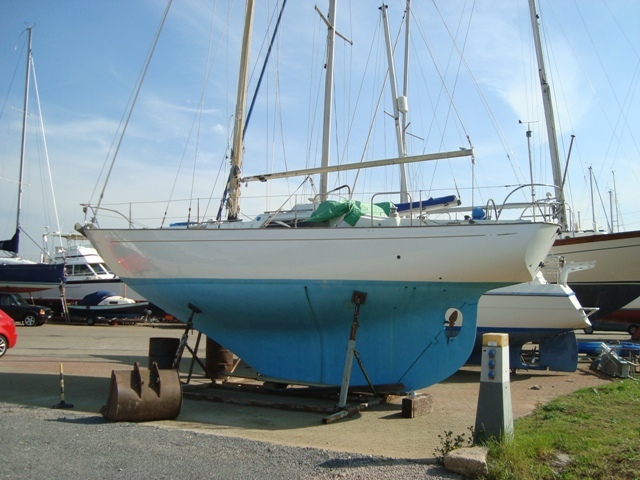 The latter has a draught of 4’ 6”, while the bilge keel boat draws 3’ 6”. Both of them have secure centre-cockpits protected by fixed windshields, a feature by which Seadogs can be identified. Reefing in strong winds is simply a matter of downing the mainsail which leaves the yacht balanced and manageable. Her wide side decks and high, strongly-supported safety lines are effective, enabling the crew to securely move around the boat. One Seadog has completed a solo circumnavigation, which says something for the viability of these yachts as ocean cruisers. The shallow draught version can transit through the French canals, and to make things easier in that respect, her masts are mounted in tabernacles, which simplifies the job of lowering and raising them. Her 36 HP Perkins Diesel, situated under the cockpit sole, provides more than ample power for making progress when the wind is from dead ahead. 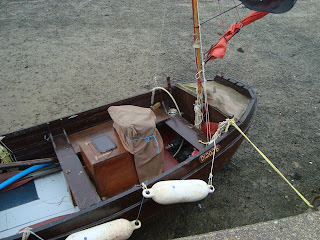 Fuel and water are stored within her bilge keels. She has two 26 gallon tanks for diesel, and two 23 gallon tanks for fresh water. By modern standards, the accommodation is not as spacious as that of today’s beamier yachts, but for a couple living aboard, there is adequate room. I like the galley situated on the port hand side by her companionway where steam and heat can be dissipated through the open hatch. Likewise, her navigation table and instruments are located the other side of the companionway, giving direct access to the navigator. A luxurious feature is her separate aft cabin where there are two single berths, or a small double. 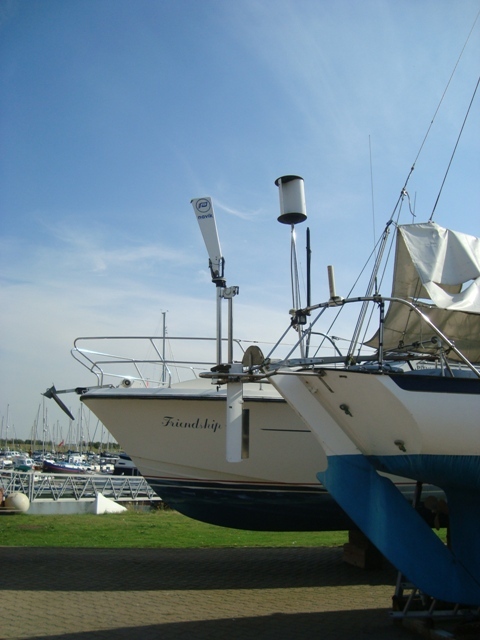 Very sensibly, Reg Freeman designed the forepeak as an area where sails and gear can be stowed. The fore cabin also houses the heads, a basin unit and two hanging lockers where unwanted clutter can be hidden away. 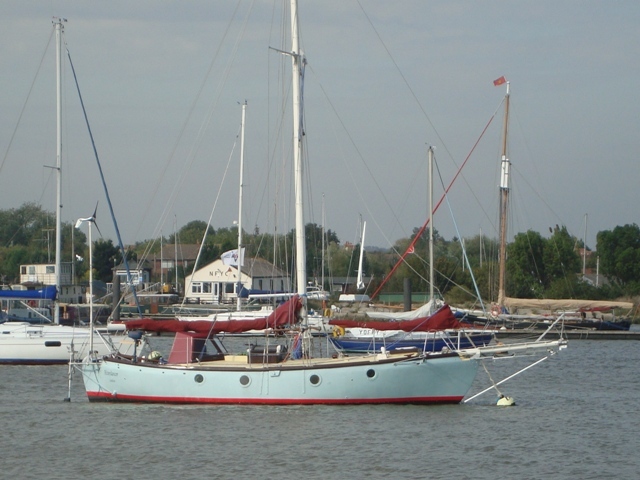 The majority of Seadogs where manufactured by Reg Freeman Yachts; others were made by J. G. Meakes and Company. Some hulls were moulded in Holland for home completion, and one or two of them were fitted out as motor yachts. Altogether, 140 Seadogs were built between 1967 and 1974. The Seadog Owners’ Association states in their website that 126 owners are members of the Association, all with Seadogs in commission. That says a lot for the durability of the Seadog 30 and their popularity. I’m constantly amazed at the amount of information there is available from the World Wide Web. Yesterday I mentioned that I had visited Wallasea Island where I photographed old navigation buoys that had been retrieved from the River Crouch as part of a buoyage improvement scheme. I also photographed ‘Marie Louisa’, the Maplin Firing Range Safety vessel. She was docking at Essex Marina, presumably after a stint when her crew had maintained watch during a firing session. This 26 metre 147 tonnes, ex Dutch trawler docked beside an outer pontoon without hassle. 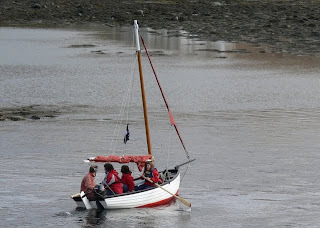 The photo shows her as she was being gently reversed to bring her stern towards the pontoon. A handler grabs a warp from the ship’s counter for making it fast to the pontoon. 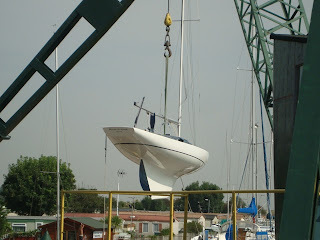 Her bow warp dangles within reach for the handler who will attach it to the pontoon. From the website* of Barbary Charters, it would appear that they are the owners of ‘Marie Louisa’. Amazingly, she has 3 heads, 2 showers, 2 single cabins, and a crew’s cabin with 4 bunks. On the upper deck there is a dining area and a saloon, a galley and a scullery. The ship’s navigator has a gyro compass and Furuno radar which is linked to an electronic charting system. Apart from the gyro compass, that’s nothing more elaborate than navigation equipment found aboard many yachts today. Surprisingly, her 300 HP Gardner 8L3B Turbo diesel engine can only generate a speed of 8 knots, but she does have a fast rib that can be launched and retrieved by the use of mechanical davits. She has a maximum draught of 3.2 metres which means there are limitations as to where she can be deployed in the Thames Estuary. 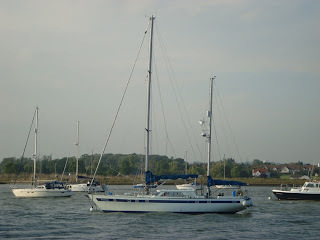 Mostly, I have seen her anchored a short distance to the east of the Crouch Buoy, from which position her crew can monitor vessels coming in and out of the River. 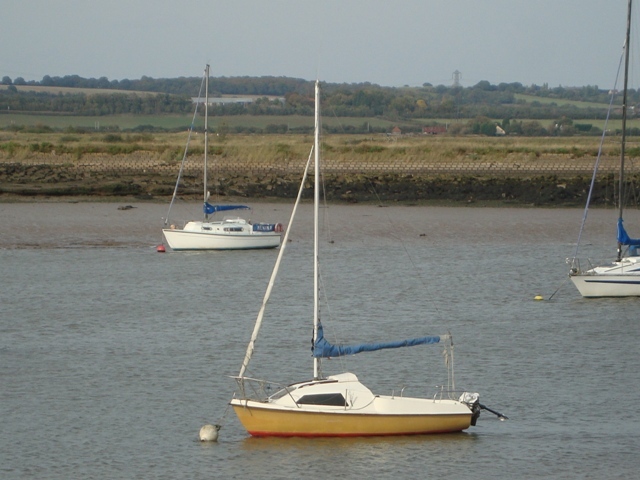 Like thousands of sailors, I’ve sailed in and out of the River Crouch many times between Fairway No 1 Buoy and the Whitaker Buoy, which is well clear of Foulness Sand. Not so long ago I was sailing ‘Talitha’, my small keelboat, into the mouth of the River Roach, and I was surprised to find a new green and red buoy marking Branklet Spit. I was even more surprised to discover a brand new port hand buoy further to the South with the name Crow. It took me a little while to twig on that something was different. Back in the Crouch, a closer inspection of Horse Shoal Buoy and Fairway No 1 confirmed there had been a big makeover of the buoyage system. Yesterday I was at Wallasea Island, and my eagle eye did not fail to observe a pile of shabby buoys that had been dumped in the storage yard by the big ship jetty. Around them there were stacks of wood, metal rods and large coils of rusty wire. Beyond there was a series of dilapidated warehouses. Was this an Arts Council funded project? It could well have been, for if you look at this scene with the eye of an artist you will observe that in the apparent chaos there is order – a functional order brought about by the necessity for access by dumper trucks etc. 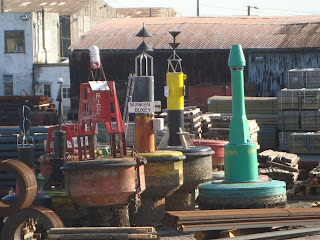 Objects are grouped according to type, e.g., stacks of wood, lengths of steel rod, coils of wire, and slap in the middle are the iconic buoys. The past function of these faded relics can be ascertained by their top marks, their colours and the shapes of the buoys themselves. When I photographed them they were bathed in defining sunlight and their forms were enhanced by telltale shadows imparting a chiaroscuro effect. ‘Sunken Buxey’, ‘Ridge’, ‘Crouch’ and ‘Swallow Tail’; these familiar names brought back memories. At one time or another they have marked my progress in or out of the Crouch, perhaps when it was blowing old boots or when the visibility was poor, or when rain was pelting down or in pitch darkness, hoping to spot their characteristic flashing lights. Late evening the dazzling, setting sun could make finding these buoys so very difficult and testing, especially at the end of a long day when all I wanted was to get in, drop the hook and prepare for a good night’s sleep. There were times when my heart pounded and I was relieved to find that I wasn’t about to crash my yacht on Swallow Tail Bank. Now, with better buoyage, including an additional 26 new buoys, getting in and out of the Crouch will be safer and easier. I had thought that with improved electronic navigation systems, GPS and the like, the Authorities would reduce the number of buoys; whereas it is the exact opposite, on account of spoil from the Crossrail project being shipped to Wallasea Island. New charts will be required yet again, and the chart of my GPS is out of date! The owner of an able yacht like ‘Dualin’ which has a lifting keel, has the best of both worlds – he can confidently sail her offshore, and yet be equally confident when sailing in shallow waters. 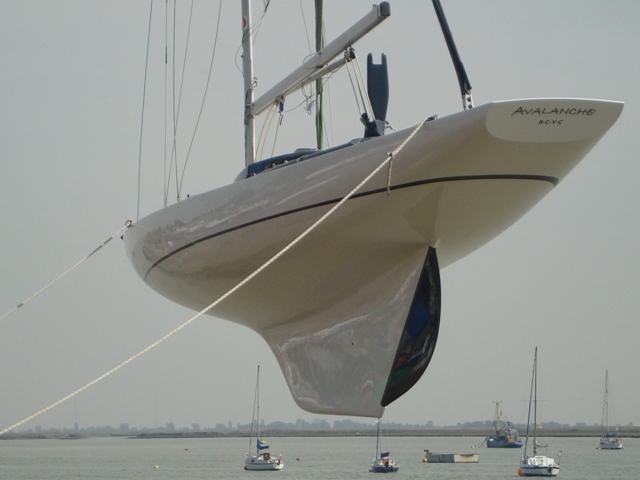 If her lifting keel touches bottom, that’s not a problem, because it can be retracted, allowing the yacht to return the way she came. 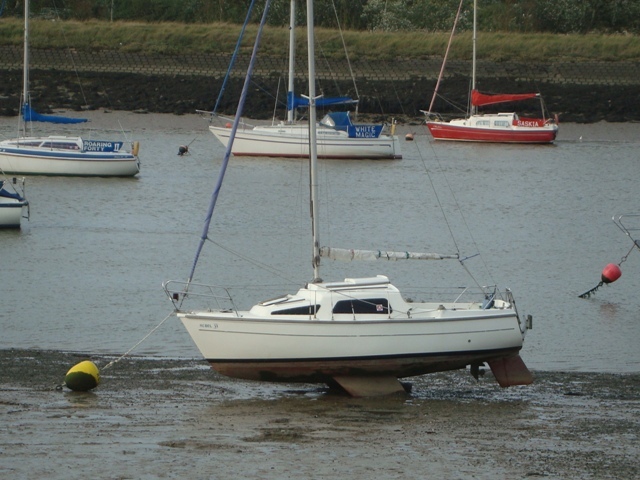 In any case, a Duellist can go to windward, even when her lifting keel is fully raised. She has standing headroom, and the quality of finish, both inside and out is first-class. This yacht is ready to sail right now, anywhere, perhaps around the world if you have the time and money. 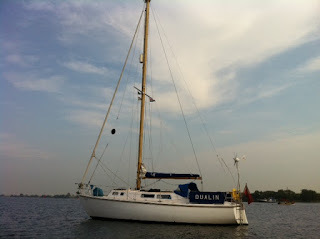 She has recently returned from a very successful cruise to the Netherlands when she was put through her paces. 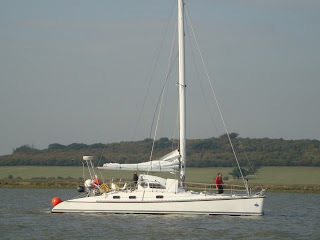 Her crew reported that they had experienced a variety of sea conditions and they thought the yacht had done them proud. 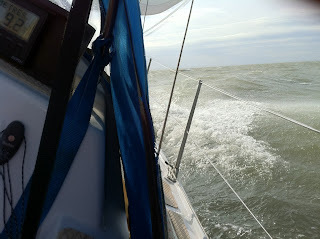 You’ll observe from the photo that the sea wasn’t smooth during the return crossing from Ostend to Tollesbury. 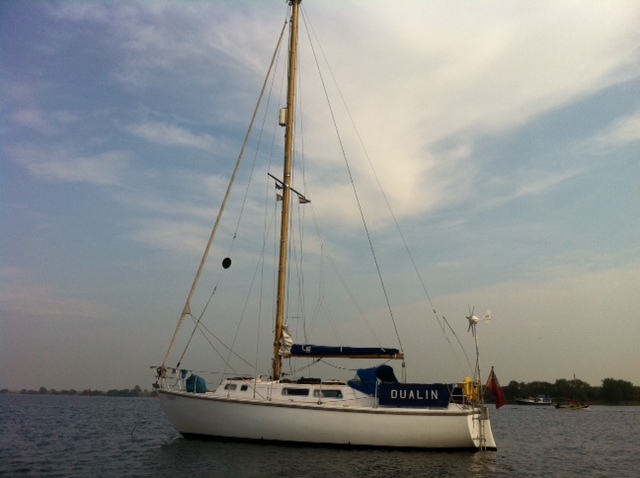 If you do your own research on Duellist 32s for sale, you will realize that at £19,950 ‘Dualin’ is an absolute bargain!! If you are looking for a yacht of this calibre with her characteristics, now’s your chance for an end of season opportunity. 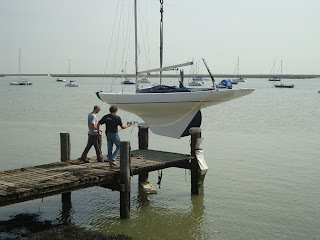 The yacht is afloat at Tollesbury Marina, fully antifouled and ready to go! I wish I knew a bit more about the dinghy pictured here. I took the photo on 8th July, 2011. 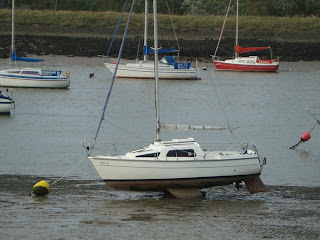 She was on the mud at Heybridge near the Blackwater Sailing Club. 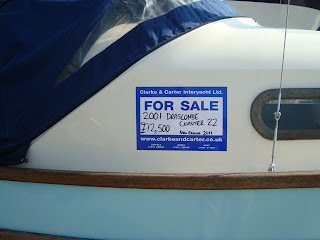 There was a similar boat for sale at the Boat Shed. (See 1st link below) Both boats are GRP simulated clinker versions of an original wooden dinghy. They have the typical form of old East Coast workboats, perhaps used by fishermen for attending to crab pots, line fishing, and setting nets or as tenders to smacks. 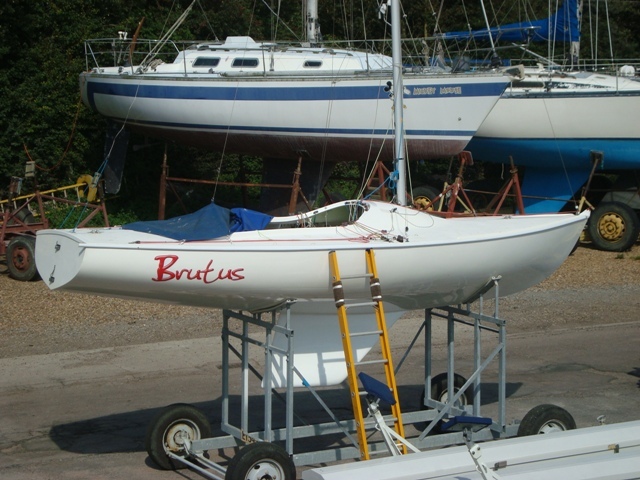 The dinghy that was for sale at the Boat Shed was built and fitted out by Peter Brookes. 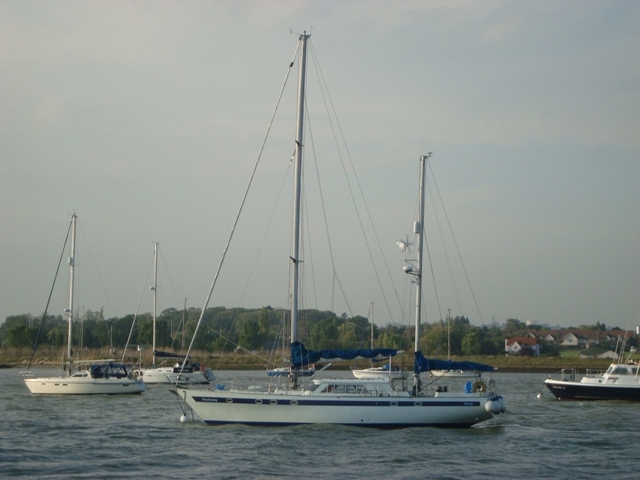 She has an identical short iron bowsprit to the one on the boat I photographed at Heybridge, which makes me think she was built by Peter. 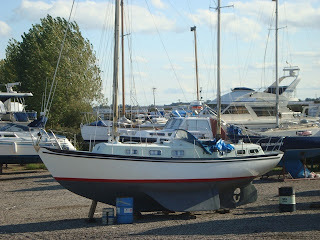 Dennis Rayner designed the GRP bilge keel Westerly 22. She was similar in concept to his hard-chined 20’ plywood Westcoaster, except the 22 had a round bilge. 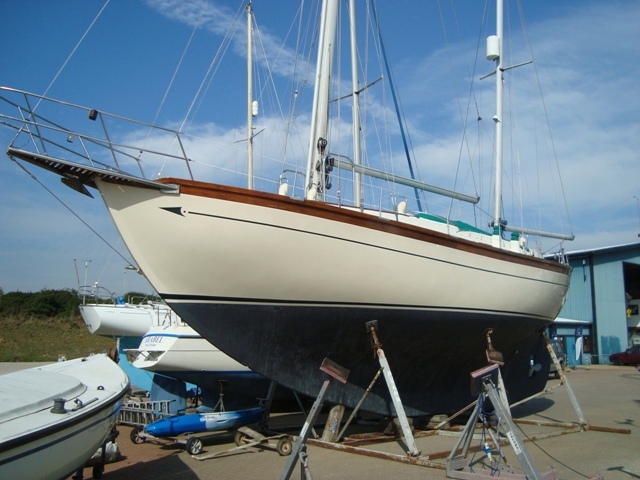 The bigger boat could be fitted with either a Gunter or Bermudan rig, according to the choice of her prospective owner prior to the boat being built. The Westerly Nomad was a development of the 22 with an almost identical hull, but her internal volume was larger; this was on account of her higher and longer cabin moulding. I believe I’m right in saying that new owners of Nomads could choose to have their yachts fitted with a diesel engine or an inboard outboard engine. 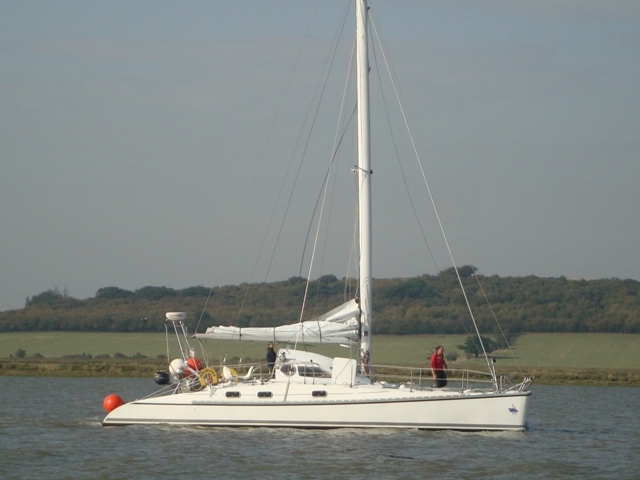 If you are looking for a sound and well-tested yacht for ocean cruising you may well consider a Rival 32. The designer, Peter Brett, has written an article for the Rival Owners Association on the history of the 32. (See link below). He mentions that at least 4 Rivals have crossed the Atlantic both ways. The first version of the yacht was known as the Rival 31. The prototype was found to have considerable weather helm when reaching, owing to her raked rudder. 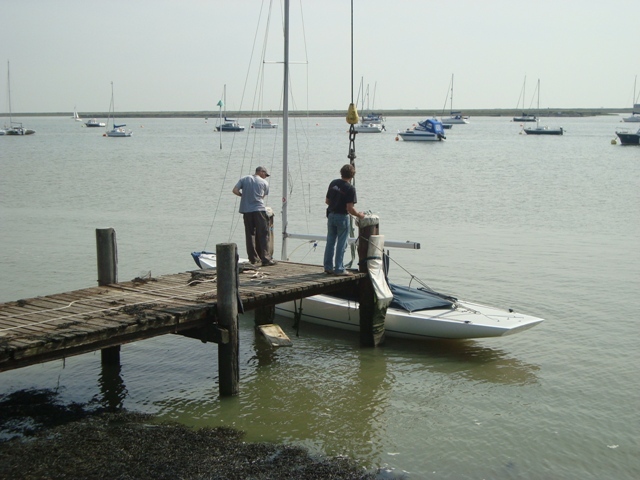 Peter rectified this in the second boat and later production boats by repositioning the rudder so that it was attached to a vertical stock within the hull. The first Rival 31 was launched in 1968 and 22 of them were built. Peter redesigned the stern by adding a short counter; this version became known as the Rival 32, of which over 200 were built. Later, he designed a longer and fuller version of the 32, the Rival 34, of which 174 were built. Owners had the option of having a deep keel at 5’ 10” or a shallower one at 4’ 8”. 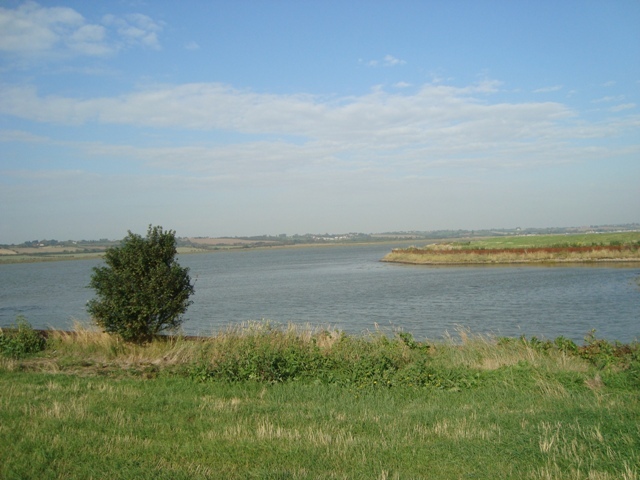 Yesterday, by way of relaxation and gentle exercise I walked a stretch beside the River Crouch where I seldom go, that’s on the south side of the River from South Fambridge eastwards as far as Landsend Point. High water at Burnham was 1530, with a height of 5.1 metres. I mention this because by the time I arrived at Landsend Point the ebb had been running for half-an-hour or more. Yachts proceeding up River would do so with the flood, and those going the other way would make use of the ebb. So there was a good chance that I would see some action, both before and after high water. As usual, when I’m beside the River I carry my camera, so that if I see anything of interest I can whip the camera out of my pocket and take a photo of it. Later, at my leisure, I can examine the digital image. Yesterday was no exception. I carried my camera in anticipation of seeing something worthy of being photographed. The first item that excited my imagination was the concrete sloop, ‘River Dancer’. I had taken photos of her before, and I had written about her on this Blog. For some reason she gets me thinking of a nomadic life, roaming the oceans. There is something romantic about her - not romance in a fleshly sense, but romance in travelling encounters, meeting people and visiting places. I imagined her anchored off some exotic island, gently rolling to the rhythm of the sea, the heavy scent of succulent fruit and the heady perfume of enticing blossoms welcome her crew ashore. There, Polynesian beauties placed colourful garlands around their necks, and the elders of the village invited them to drink Kava Kava. 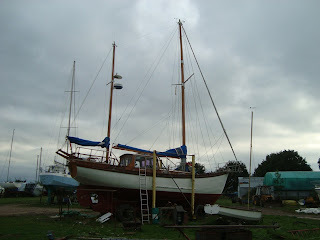 For some unaccountable reason the next item of interest was a large Moody ketch. I’m not normally attracted to ‘plastic’ boats, but this was something different. 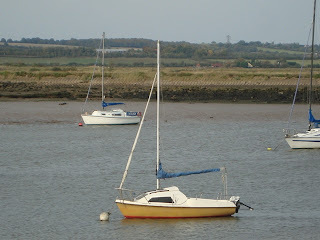 She was the largest yacht at the Fambridge moorings, perhaps forty-five feet in length. I wondered who could own such an expensive vessel. Looking at her made me fearful. Who would want the responsibility of caring for her? No doubt the owner has the means to pay someone to do it and help him sail the vessel. I certainly would be keen to take her out on open water; there to feel the wind on my cheeks and admire the power of the wind in her sails, as she speeds to windward. On a smaller scale, another Moody came zooming up the River, being driven by a stiff southeaster, with only her Genoa set. Later, when the ebb was running, she motored back the way she had come. At the same time, a large, streamlined catamaran followed behind. She gave me the impression that she would be very fast under sail. Her mast was thicker than a man’s torso, and it towered high into the air. I would be distinctly uneasy sailing her in anything of a blow, being fearful of capsizing her. Her crew undoubtedly had a problem as to where to stow the fenders. Their solution was to dangle them at the stern where they incongruously resembled baubles on a Christmas tree. Landsend Point is south of Bridgemarsh Island, about a mile-and-a-half to the east of South Fambridge. There you can feel solitude, yet you are only a little way from hives of activity. There you can commune with the Creator of the Universe, and find peace with Him, as I did yesterday afternoon. There the sun shone and the dappled water sparkled while rippling a joyful tune as it lapped the stone sea wall. The wind sighed, and there was calmness within my heart. I was glad to be alive. 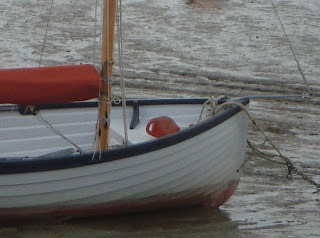 About a year ago I did an article featuring a miniature Hastings beach boat named *‘Finda’. 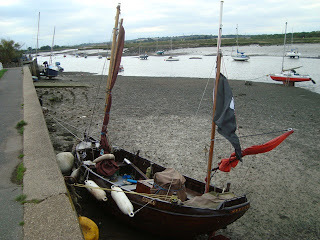 I also wrote another one on the subject of characterful boats in which ‘Finda’ was the principle subject. 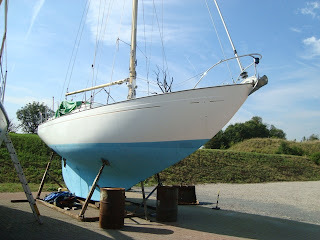 ** Today I am presenting new photos of this charming vessel. I’m pleased that her owner is caring for her. Last year I had my doubts, because she looked tatty, but I observe that she has recently been treated with Deks Olje or a similar preservative. Classic boats of this vintage need looking after; she deserves a caring owner. ‘Finda’ is an amazing example of a wooden clinker workboat that has several interesting features. 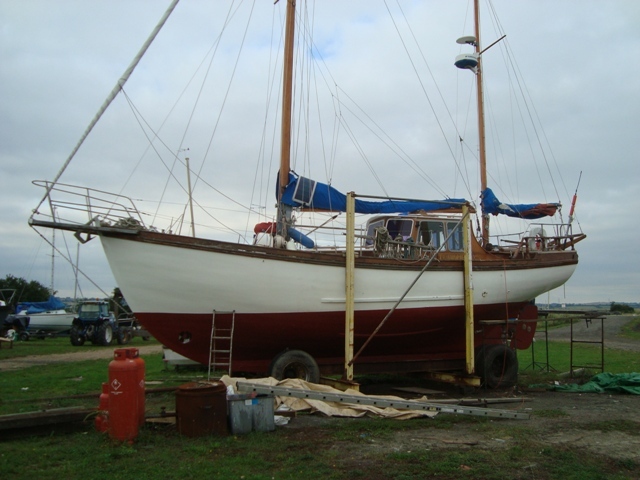 Her owner has added a mizzen with forward facing stays, which makes a lot of sense, because the sail can be squared off when the boat is running. She has a small bronze ship’s bell attached to her mizzen mast. A carved, painted figurehead that was attached to her mainmast is no longer there. 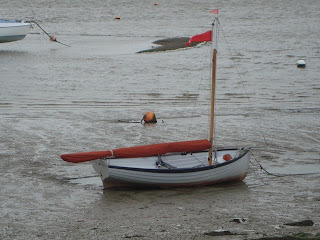 Just look at the large plaited rope fender hanging from her bow – a rarity today. 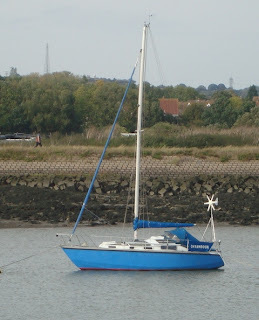 She doesn’t have flimsy mooring cleats; instead, she has five substantial Samson posts, two at either end of the cockpit and a thicker one braced against her foredeck. Under the iron horse for the mizzen sheet there’s a rack with slots in it, for what purpose I do not know, but the slots could possibly be for lines over the stern when fishing, or perhaps they could be for locking the tiller by means of a reverse extension. In my previous articles about this delightful open boat I have mentioned other features, such as her Yanmar diesel engine, rudder case and her odd-looking stern. She does not have a keel or a centreboard which would not be appropriate for a boat that has to be launched from an exposed pebble beach, as is the case at Hastings; furthermore, she has to be retrieved from the sea by being winched over pit props or similar logs. The twilight of the traditionally-built Hastings beach boat fleet? John Negus of Hullbridge has built several ketches to his own design. ‘Tammorie’ featured in this article is the prototype. She has cruised to the Mediterranean and to Scotland. 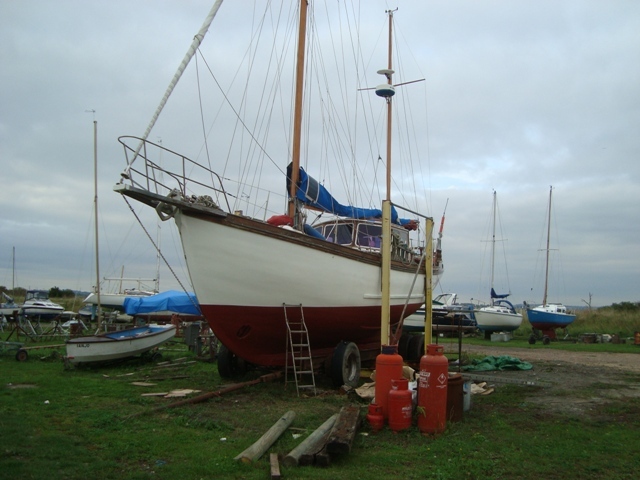 Another wooden Negus 36, ‘William George’, is for sale at Woodrolfe Brokerage, Tollesbury Marina, Essex. She was built in 1983. 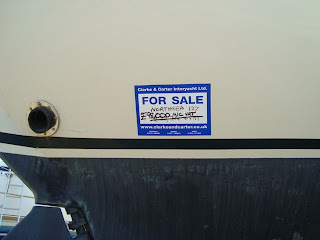 The asking price is £29,000. John has built several of these yachts, each with custom interiors. They stand out from the crowd because of their characteristic features: a large glazed wheelhouse, teak decks, wooden taffrail, varnished bulwarks and rubbing strakes just above the waterline either side of the boat. The latter is a practical touch for protecting the hull when the vessel lies alongside a quay, jetty or pontoon. Wooden davits at the stern have the dual purpose of supporting twin mizzen backstays and of accommodating a fair size dinghy. 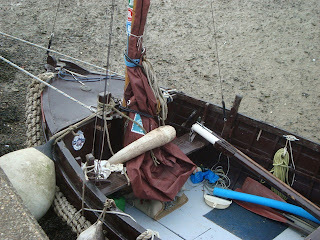 Her bowsprit incorporates a substantial pulpit for the security of the crew when working at the bow, perhaps when anchoring or attending to sails. Another very practical feature is her substantial galvanized mainmast tabernacle. 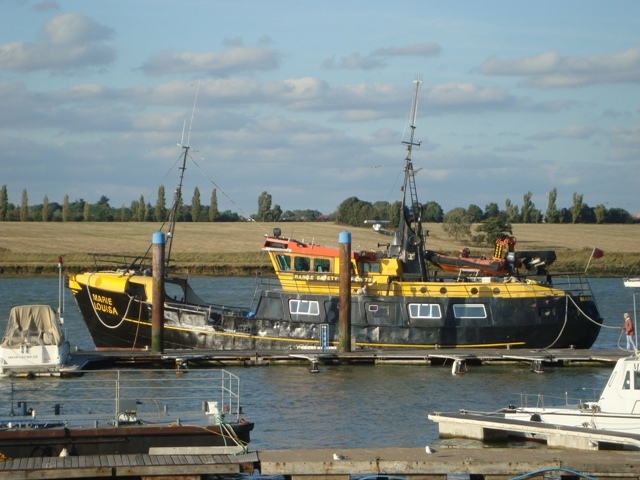 I know nothing about ‘Tammorie’s’ accommodation, but it may be similar to that of ‘William George’ which has three cabins and seven berths - this includes a double berth in her aft cabin. She has a separate heads, a decent galley with a gimballed oven, a comfortable saloon complete with folding table, and she has internal wheel steering integral with a navigation console. Her Ford 73 HP engine delivers a cruising speed of 6 knots while consuming 1.5 gallons of diesel an hour. Her 80 gallons of fuel gives her a theoretical range of 320 nautical miles but she would also have a good turn of speed under sail. I bumped into John recently, and he told me he was building an Ian Oughtred double-ender, based on the lines of a Shetland Yoal. The boat is being built for a client who lives in Scotland. John said this was a departure from building bigger boats, and that he was enjoying the project. Life is full of ‘ifs’ and ‘buts’ that could momentously change personal situations. I met my wife to be at a blind date meant for a friend who could not go on the date because he had caught the flu. He asked me to take his place. This I did unwillingly because I had a girlfriend at the time. By taking my friend’s place I was introduced to a beautiful young lady with whom I fell in love, and later she became my wife. Perhaps not on the same momentous scale of life-changing moments I agreed with my nephew that we should together buy a Telstar 26 Trimaran. She was for auction on Ebay. To cut a long story short, although we won the bid we never bought the trimaran because she did not match the description and ownership could not be proved by a bill of sale. Had we gone ahead with the purchase, I can only imagine what adventures or misfortunes may have followed. Nevertheless, I’ve maintained an interest in Telstar 26 trimarans. The vessel we nearly acquired was a Mark 1. She had had a hard life. Previous owners had patched her up around the seams between her deck and hull. Windows leaked and metal struts bracing the floats were badly corroded. Lockers had water in them and there was much condensation within the cabin causing bunk cushions to mildew. Despite this picture of neglect, there are Mk 1 Telstar trimarans in good condition to be had for very reasonable prices. What you get is a boat that can average 7 knots, and with the right conditions she can sail at 14 knots. She has better accommodation than most 26’ monohulls of her time, i.e., the early 1970s. 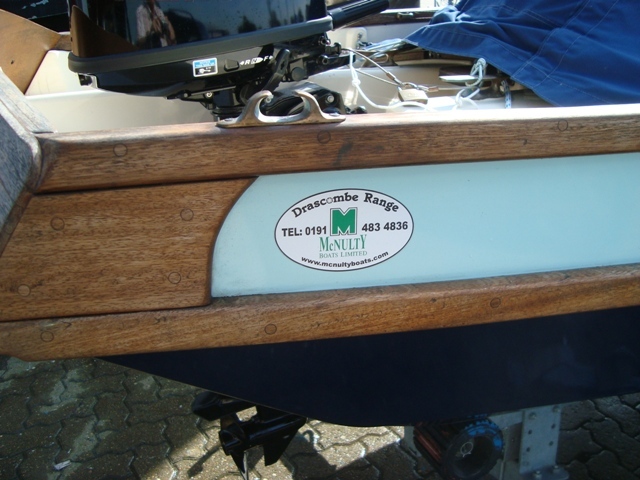 Tony Smith designed the boat and successfully established a business in Sandwich, Kent producing and marketing them. A.J.S. 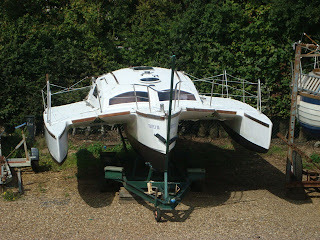 Sandwich Yacht Construction altogether manufactured more than 300, Mk 1 Telstar trimarans. Between 1976 and 1978, eighty-eight Mk 2s were manufactured. The main difference between the Mk 1 and the Mk 2 was increased headroom to 6’. 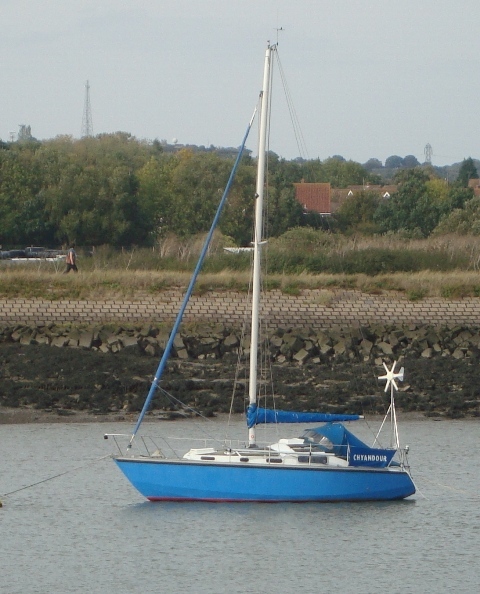 A Mk 3 version produced between 1978 and 1979 was markedly different from previous models by having a beamier main hull and a wider overall beam. Rodney Warington Smyth designed the original wooden Falmouth Gypsy Mk 1. The Mk 2 had a GRP hull and the rest of the boat was GRP sheathed plywood. The Mk 3 was entirely moulded in fibreglass. Penryn Boatbuilding Complany built most of the Mk 2 boats. Gweek Boatyard completed six Mk 2s before Trecarne Boats acquired the moulds from them. 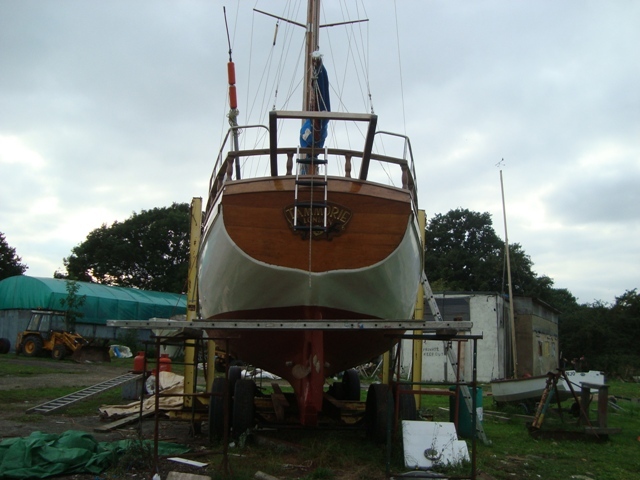 Trecarne Boats of Redruth redesigned the decks and coachroof to increase the volume of the interior. Their version became the Mk 3. 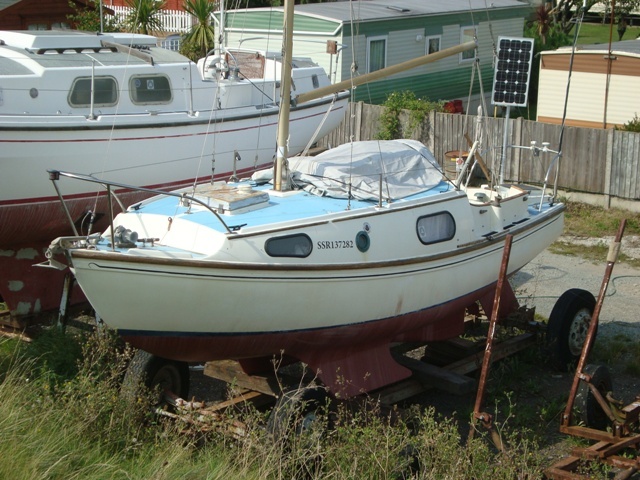 The quality of second-hand Mk 2 Falmouth Gypsy yachts can vary considerably, because some of them were supplied in basic kit form, or just with their hull and deck bonded. The quality of the internal finish very much depended on the skill of those who fitted out the hulls and the materials they used. A really good quality Falmouth Gypsy may be obtained for about £4,000 to £4,500. Almost to the day, last year, my blog entry was about the National Squib keelboat. 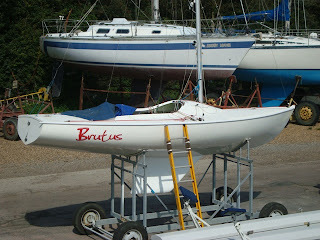 I have little to add to that article*, but here’s a photo of ‘Brutus’, being made ready for launching at Rice and Coles, Burnham-on-Crouch. I’ve also included extra links to websites featuring Squibs. The Royal Corinthian Yacht Club has a strong Squib racing fleet with a number of sailors who do well at National events. The racing programme runs from early March to late November. Races take place on Saturdays, Sundays and Wednesday evenings. The Class Captain is Phil Aspinall. More information can be obtained from squibs@royalcorinthian.co.uk . Only three GRP North Sea 127s have been built, which is a shame, because from all accounts they are excellent long-distance cruising yachts. The prototype was built from wood, and the first GRP yacht built in 1998 could accommodate a crew of six, but she could have been managed by two. These double-ended vessels from the drawing board of David Cannell are similar in shape and size to the famous Norwegian lifeboats designed by Colin Archer, which are renowned for their excellent sea-keeping qualities. 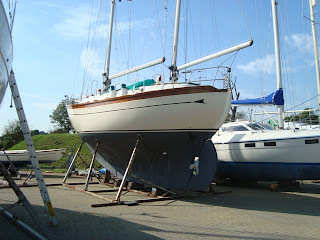 With an overall length of 43’ 3”, North Sea 127s have a good turn of speed, regularly clocking 6 or more knots under sail. Their voluminous hulls are well-fitted out with comfortable furnishings and loads of locker space for stowing gear and provisions necessary for blue water cruising. 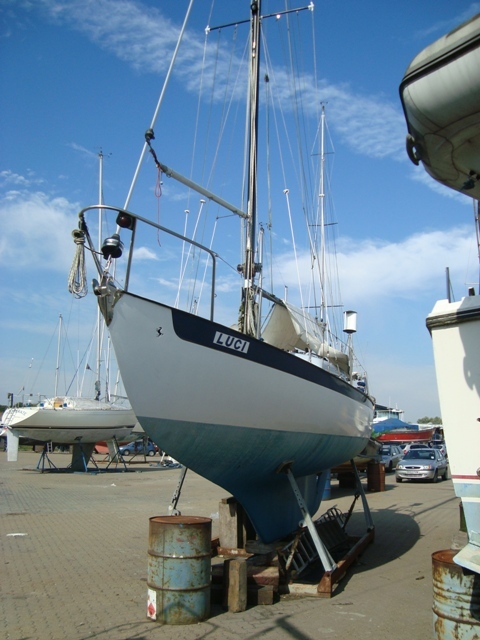 Her ketch rig makes it easy for her crew to reef her sails because none of them are too large, and with a beam of 12’ 9” she presents a stable platform for those working on deck. In addition to building North Sea 127s, North Sea Craft of Colchester also produced Tamarisk Cutters and Samphire sloops. 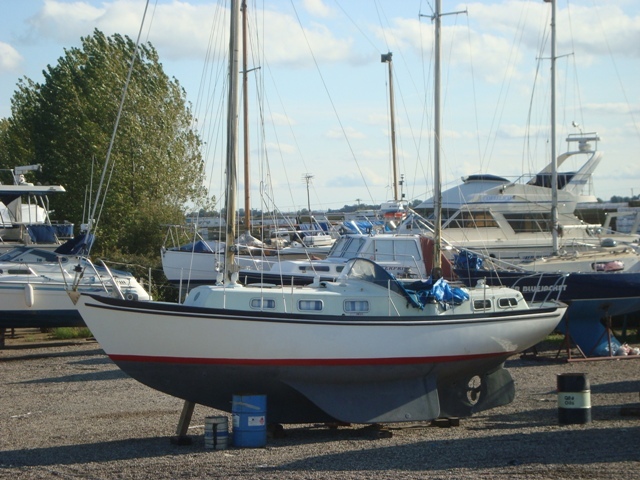 A friend of mine owned a Nicholson 32 and kept her in a mud berth at Combwich, which is not far from Bridgwater, in Somerset. She was an old boat that had belonged to the RAF Sailing Association. 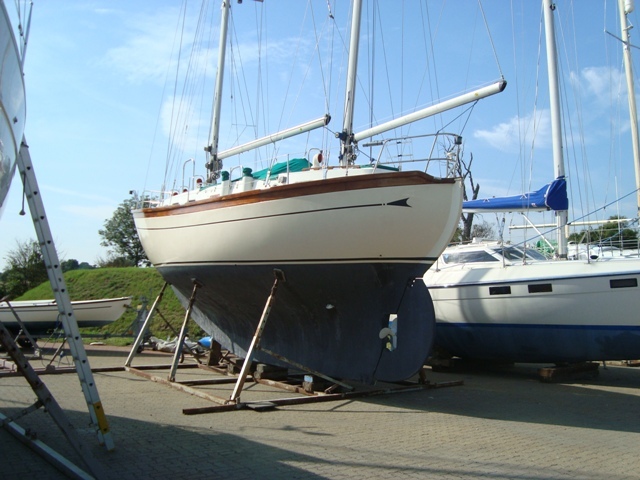 He renovated the yacht, including repairing a hole in her hull. She had taken a bit of a bashing during her lifetime, but by the time he finished restoring her she was fit to go anywhere. 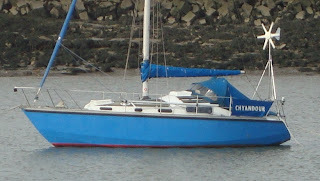 I recollect sailing with my friend in the Bristol Channel when we ran into a Force 7 off Ilfracombe. While shortening sail, the tail of the main halyard was lost, which meant we could not efficiently raise that sail. Despite the conditions, we were able to put into Ilfracombe, where the yacht dried out beside a quay. She was one of those yachts that give great assurance to those who sail on them. She was a bit like a Contessa 32, but more powerful. I felt she would cope with the toughest of conditions, and yet have a good turn of speed in light winds. Everything about her was robust. 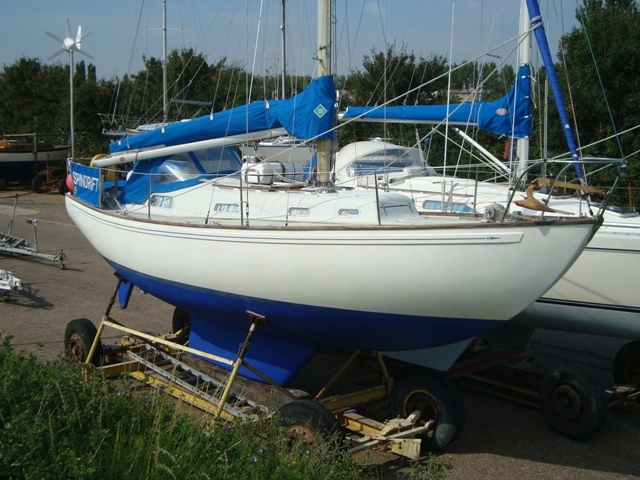 I wouldn’t attempt to outline a history of Nicholson 32s, of which many versions have been produced, but if you are interested, you can visit the ‘History of the Nicholson 32’ webpage via the link below. The Invicta 26 comes from the stable of E. G. Van de Stadt. He designed her in 1964. 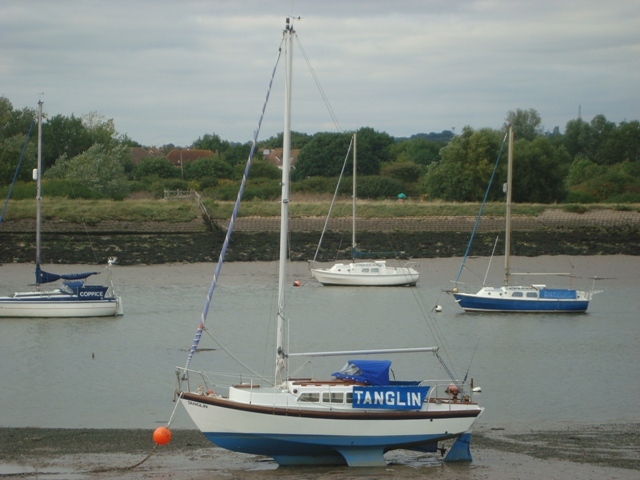 She bears the hallmarks of his earlier designs: relatively narrow hull and transom hung rudder. She also has characteristic rounded hatches. Van de Stadt was a pioneer of GRP yacht construction in the late 60s. I have owned three yachts designed by him and they have all been beautifully balanced when under sail. I could move the tiller of my Pioneer 9 with my little finger and she would immediately respond. The drawback of such fine balance was that the tiller could not be left unattended, but with the Invicta she has a keel that extends for at least half her length, and more than two-thirds of her waterline length, which gives her good directional stability. 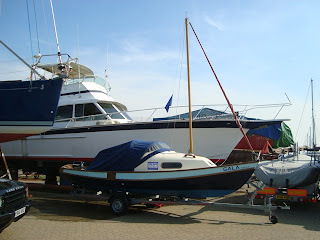 In her time, the Invicta was a modern interpretation of a Folkboat, and she was also similar to a Contessa 26, except the latter’s keel continues to her transom. These yachts do not have a lot of internal space, but they are very sea-kindly and sail well to windward. Being narrow of beam they heel considerably when hard on the wind and they have a fair draught of around 4’. Tyler moulded the Mk 1 Invicta hulls which were fitted out by a variety of builders. The Mk 2 had a little more headroom and she was moulded by Fi-Craft of Essex. They also fitted out their hulls, as did Salterns Yacht Agency. Production ceased in the late 1970s. 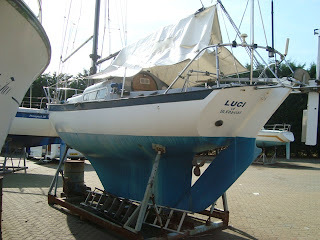 ‘Luci of Burnham’ has been on the hard at Burnham Yacht Harbour for more than a year. She would appear to be well- equipped with all the equipment necessary for long-distance cruising. She has a Navik self-steering gear, a rotary wind generator, external GPS antenna and a furling headsail. My guess is that’s she’s for sale, but I cannot find her on the books of any broker. For anybody seeking a yacht of this type, she may well be worth checking out. In that article, Max who owns Bursledon Blog commented that he was looking forward to a summer of simple sailing aboard his recently acquired Drascombe Coaster. I gathered that he was also looking forward to meeting Julian to compare his Coaster with Julian’s Bay Cruiser 20. I wonder how things went. If Max or Julian happen to read this, maybe you could make a comment to tell us how you got on? Perhaps you’ve already done articles about the get-together on your own blogs. Yes, there are a good many Dragons at Burnham-on-Crouch, not the sort that spit fire and zap people with their tails, but graceful racing yachts that can be seen zipping up and down the River Crouch on Saturdays and Sundays during the racing season. At alternate weekends the Royal Corinthian Yacht Club and the Royal Burnham Yacht Club host races for Dragons. As many as 12 of them race on a regular basis. Altogether there are about 20 Dragons based at Burnham. Only a stone’s throw from the Royal Corinthian Yacht Club there is Petticrows factory where the majority of Dragons are built today. The first one was built from wood in 1928 at the yard of Anker and Jensen in Norway. Johan Anker was an accomplished racing yachtsman. He designed the Dragon to meet a need for a relatively cheap 20 square metre racing yacht with Spartan accommodation which would allow her to be sailed from one regatta to another. Over the years Dragons have been developed to become highly efficient racing yachts that can take a crew of four. Altogether there are at least 1,400 of them worldwide which are registered to National Dragon Class Associations. National events can see 40 boats on the water and at major International Championships there can be as many as 100. The history of the Dragon from when she was built from wood to the present time with modern synthetic materials is long and complicated, but you need look no further than the website of the British Dragon Association to discover the facts. I love these iconic yachts that effortlessly slip through the water, barely leaving a wake behind them. ‘Avalanche’ seen in the above photos would appear to be brand new. She’s shiny and without blemish. Her owner must be very proud of her.